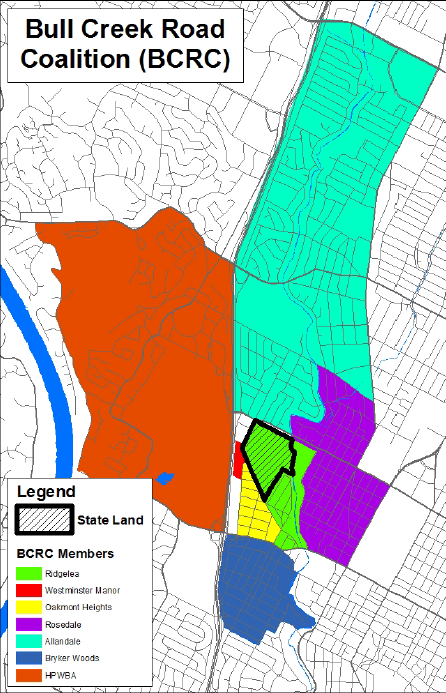 The Bull Creek Road Coalition, or BCRC, was formed in 2012 and is made up of residents of the six neighborhoods surrounding the 75-acre former State-owned tract at West 45th Street and Bull Creek Road in central Austin. Once it became clear the State intended to sell or lease the tract for private development, the neighborhoods formed this coalition to work constructively with the State, City, and prospective developers to ensure that the tract is developed in a way that will be compatible with and enhance the existing neighborhoods. The neighborhoods represented in the Coalition are Ridgelea, Rosedale, Oakmont Heights, Allandale, Bryker Woods, and Highland Park West / Balcones Area, which together comprise more than 7,500 Central Austin households.